Gratitude Archives - Scientific Ink passed away on Thursday, January 6, 2011. She died comfortably at home in Ann Arbor after a short illness. Beverly was my faculty advisor for my PhD dissertation in ecology, and in that role she helped me think critically and write clearly. Yet, she fostered more than my scientific interests, she recognized and encouraged the creative artist in me, pushing me to explore my interest in and talent for photography. We attended music and dance concerts together. And, she catalyzed the transformation of my perspective and thereby my life by introducing me to my meditation practice, Siddha Yoga Meditation. Her beautiful Old West Side Ann Arbor bungalow served as a gathering place. She brought out the gourmet chef in all of us, as we competed to offer potluck contributions that could stand beside hers on the dining room table. She invited others to cook, drink, dine and dance in her home, and was always grateful when someone wanted to clean up the piles of pots and dishes created during a collaborative cooking event. New Year’s Eve, December 2006. 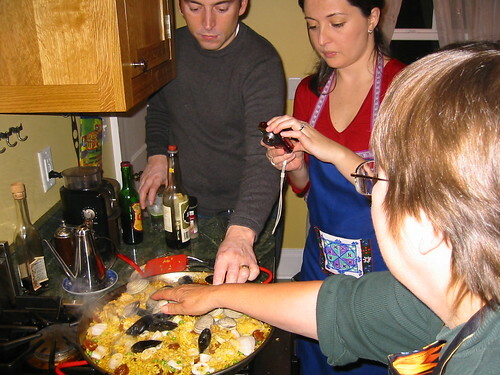 We made paella in Beverly’s kitchen. Yum! From left, Dave, Victoria, and Beverly (foreground). She lived a full and enthusiastic life and had, in my opinion, a good death, on her own terms, surrounded by devoted friends. I was honored to be with her and her friends in the days preceding her death as she slipped from consciousness. During the last few days I have met friends of hers new to me, and I have been impressed by her good taste. May I be as fortunate in my friends and in my passing. I feel so grateful to have known her. 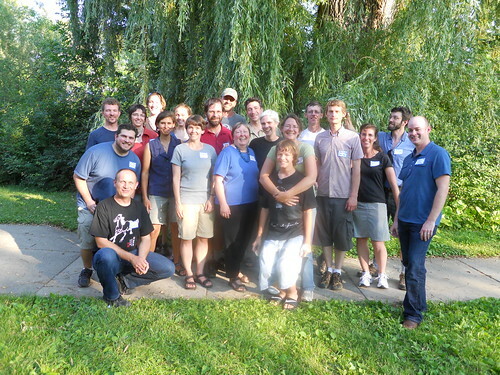 Beverly Rathcke (center, in blue), surrounded by her University of Michigan graduate students from the 1990s and their families. Taken at her retirement party summer, 2010. Summer is grand – sultry, sunny, and replete with yummy local fruit. Michigan tart cherries – yum! The king of local fruit is the sour or tart cherry. The tart cherries are a semi-translucent red, like captured sunlight, which they are. They make the most amazing cherry pie. Oh, and they don’t travel well, so they’re not something that gets hurled across the globe with abandon: you have to enjoy them right here. And maybe because of that, for me, they’re also connected to memories of other summers and other pies. I sat on my patio this evening, pitting these cherries with a hairpin, feeling their juice running down my forearm to my elbow. More than most things these days, these cherries are a signal of a particular place and a particular moment in the season. Slurp in the summertime. We moved into a new place in August. For a while there we were almost camping because we had the kitchen ripped out…it didn’t feel exceptionally homey. Our fabulous Ann Arbor construction crew gave us a working kitchen in our bump out just before Thanksgiving. We moved our plates, spices, glasses, and cookware into the kitchen the weekend before family arrived from Massachusetts and Rhode Island. And, then, with the help of Dave’s family cooking at the house, china plates from my family, delivered a few days ahead so we could wash them, mashed potatoes and appetizers from Fenton, sweet potatoes from Kalamazoo, and ambrosia fruit salad from Rochester Hills, we had a great meal. The place was full – we had fourteen for Thanksgiving dinner. Six from the “Greiling” (Johnson) side: my aunt and uncle, my cousin and her family of four (hubby, two kids, and one on the way), and three on the “Bondy” (Sopt) side. And, because of lovely memories and shared traditions, several more people were there in spirit. My Grandmother Greiling, whom I never met, shared her china with us. Grandma Higbie’s pie safe held the desserts, and Dave’s Grandfather Bondy contributed beautiful flower arrangements. I wore pearls my father gave me, and a bracelet from my mother. I am thankful for everyone who blessed our home that day – to inaugurate our kitchen and celebrate with us. Now, finally, after a few months in the house and a handful of days in the new kitchen, the new place feels like home. I’m on vacation. And I read The Tall Book: A Celebration of Life on High by Arianne Cohen today. Just sat down and read it, cover to cover, with a break for a fishing trip and dinner. Very pleasurable. I read sections aloud to my husband, to explain why I was laughing out loud. I learned a few things (why it can take generations to attain a genetic height potential, due to environmental effects passed down somatically)…and I definitely recognized a feeling and a pattern or two in this straight talking and funny book. Oh, and I’m quoted on pp. 169-170 (excerpt from my tall blog post). Arianne Cohen details how the tall and the super-tall are privileged misfits – commanding higher salaries on average, but unable to find clothes or seats that fit. I’ve always been a misfit – knees jammed into the back of the airplane seat ahead of me, not in any way average, despite my desire to blend in. Yet this book showed me lots of ways I’ve benefitted from this, and made me thankful for my own tall mom who showed me the ropes and who did not make me feel at all like a freak (who knew people gave hormone therapy to tall girls to keep them from realizing their height?!). I’m going to need a stack of these to share with tall friends, mothers of tall folk, those who love tall folk, and other humans. Learn more at TallBook.com.